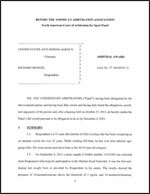 USADA announced today that an independent American Arbitration Association (AAA) panel has issued a written decision finding that Kirk O’Bee, a U.S. athlete in the sport of cycling, has received a lifetime suspension for a second doping offense based on his use of synthetic erythropoietin (EPO) and human growth hormone (hGH). The AAA panel also disqualified O’Bee’s competitive results back to October 3, 2005, including O’Bee’s 2007 criterium U.S. national championship. O’Bee, 33, had previously received a one-year sanction from USADA after a sample collected from him on June 10, 2001 at the USPRO Championships in Philadelphia, Pennsylvania, tested positive for testosterone, a prohibited anabolic agent. The recent AAA decision found that O’Bee’s sample, collected in an out-of-competition doping control on May 20, 2009, was positive for synthetic EPO. The AAA panel also found that documentary evidence obtained by USADA and introduced at the hearing, including emails reflecting the purchase or use of prohibited substances, such as EPO and hGH, and purchase of a blood measuring device, established that O’Bee had actually committed a second doping violation by at least October 3, 2005, nearly four years prior to his second positive drug test. The AAA panel ruled that the second positive test and evidence of multiple purchases of prohibited substances should result in lifetime ineligibility. As a result of the decision, O’Bee has been disqualified from all competitive results achieved on and subsequent to October 3, 2005, including forfeiture of any medals, points and prizes. The AAA panel decision followed a full evidentiary hearing. Mr. O’Bee currently resides in North Vancouver, British Columbia. HGH and EPO are in the class of Peptide Hormones, Growth Factors and Related Substances and are prohibited under the USADA Protocol for Olympic and Paralympic Movement Testing and the rules of the International Cycling Union (ICU), both of which have adopted the World Anti-Doping Code (“Code”) and the World Anti-Doping Agency Prohibited List.